Oblix Lounge Bar is part of Rainer Becker and Arjun Waney's restaurant, Oblix. Found on the 32nd Floor of The Shard, Oblix Lounge Bar has a fine selection of wines and cocktails and hosts live music. Do you work at Oblix Lounge Bar? What did you think of Oblix Lounge Bar? Oblix Lounge Bar makes for an obvious celebration spot, halfway up The Shard and all. But with a superb cocktail offering and a bar menu almost restaurant-sized, it’s worth taking the dizzying trip up that elevator with a little more frequency. Take the lift halfway up The Shard – staggeringly, Oblix is on floor 32 , which is about the tip of most other London skyscrapers – and you’ll enter into a darkened lobby, surprisingly enough. This is the first twist and turn from Oblix Lounge Bar, where you’re led down a dark, cave-like passageway without the views you’d been expecting in sight. Another twilight passage opens into the light, but you’ll still have to navigate your way around the bar to glimpse that all-important view you’ve been waiting for, a scene of London far and wide with The Gherkin staring right at you and looking comically dwarf-like by comparison. This big reveal is the first trick up Rainer Becker’s sleeve. The bar is stripped-back sophistication – all nudes, charcoals and chocolate browns in clean-lined slabs of table and buffed suede cushions. The décor aims to recreate the classic design of a New York cocktail lounge of the Roaring Twenties, but does so in a modern, minimal and muted fashion, with the odd touch of Art Deco creeping in, best witnessed in cute, cube block table lanterns. And a grand piano in the corner completes the effect, although by day, this minimalism makes the room feel somewhat incomplete. Once night creeps in, though, the bar’s décor comes into its own, light reflecting in from across the city. Oblix Lounge Bar attracts an inevitable business crowd by day, who hold meetings or power lunch at tables. This element is certainly still present as night descends, but you’ll also find the obvious clusters of couples on an especially romantic date or larger parties out for a special occasion. There’s also the odd celebrity spot – the rich and famous tend to take up court at prime seating overlooking the capital. Although the temptation to get happy-snapping is there, most punters are the showy kind and a trip up The Shard is all in a days work; they show restraint in whipping out their camera phones for that photo opportunity. Nightly live music helps obtain the Americana vibe, with a blues band taking up a corner of the room. Waitresses swish round in custom-made Ted Baker apparel and are thoroughly friendly and attentive in table service. Oblix Lounge Bar is definitely most alive by night and takes on that kind of New York edge that would bring an enthusiastic grin to Daisy Buchanan’s face. Food from the restaurant is available for brunch, lunch and evening snacking and makes for ideal sharing fare. The menu’s focus – unlike at Rainer Becker London offerings Roka and Zuma – is loosely a European twist on flame-grilled, New York classics. So you can tuck into customary sirloin steak or you can go for more refined dishes like a beautiful sea bream (£22) served with savoury olive tapenade and marinated in a zesty garlic and fennel paste. Seared beef, lime, chilli, garlic and ginger soy (£14) shows off Becker’s Japanese restaurant heritage but marries it with that bold, charcoal flavour from the fiery grill in one of the most delicious dishes on the menu. Non-carnivores have no reason to fear though, as the humble vegetable gets the royal grill treatment, too, and to great success. Wood-fired roast beets (£7), for example, are dished up with goat’s curd and crunchy puffs of rye cereal for extra texture to a dish that’s big on bold flavours. More subtle is burrata, olives and datterini tomatoes (£15), a pretty plate which showcases rich and creamy cheese with lively accompanying ingredients. It’s fair to say that food at Oblix is intense on flavour. Bringing things more in line with the American theme is the dessert menu, where a chocolate and pecan nut brownie catches the eye, but should be overlooked in favour of the New York cheesecake (£9). This traditional, baked cheesecake is a genuine taste of the Big Apple, served with whipped cream, fresh fruit and a shortbread biscuit. This is where seductive 1920’s Americana comes into its own; cocktails are boozy enough to bring rosiness to cheeks and make plenty of reference to the kind of cocktails New York made most famous. Indeed, the menu pays homage to the birthplace of cocktails with the Betsy Theory (£16.50), a signature drink inspired by the legend of Betsy Flanagan, a lady rumoured to have supplied liquor concoctions on the frontlines during the American Civil War. Served in a silver plated cup, this twist on the Julep blends Bulleit Bourbon – true Kentucky whiskey – tobacco, cacao liqueur, mint and peach bitters and is a hefty drink with a surprisingly sharp fruity aftertaste. Similarly strong, the Bitter Rose (£12.50) is an aperitif of rose petal gin, Campari and sweet vermouth, a smooth and tart drink not dissimilar to a Negroni that will satisfy any true cocktail fan. For the sweeter palate, sugarcane cocktails like the Plum Rum Mai-Tai add a taste of the tropical, while sparkling drinks are suitably sophisticated – the Rhubarb Sparkler (£14.50) mixes Champagne, gin and rhubarb for a sweet and subtly bitter taste. Cocktail connoisseurs or regulars at Oblix Lounge Bar will enjoy the mellowed cocktail service. 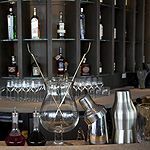 Here, drinks such as a Classic Manhattan or French Quarter Sazerac as well as any customer’s favourite off-list cocktail are matured in 1800ml crystal decanters for six months at a premium of £650. Decanters already on brew for customers prettily decorate one wall of the bar. Moving away from cocktails - as many of the macho clientele do - the craft beer trend is taken to the kind of heights you can expect for The Shard, with ‘artisan’ beers provided from St Mungo (£5.60) and Harviestoun (£5.60). And Scotch whisky and American whiskey is in full stock to meet demand from the suited and booted. While by day Oblix Lounge Bar generates just enough ambience from the big reveal of its view and a flavour-filled and flame-grilled food menu, it’s by night that this homage to the birthplace of the cocktail sits most comfortably. There you’ll find a moody, modern take on the 1920’s New York lounge, with potent and perfectly balanced cocktails to match.